Tenor Alfie Boe and gospel star Jaz Ellington perform hymns and songs with choirs and 5,000 singers at the Royal Albert Hall. Browse content similar to Britain's Biggest Hymns Big Sing. Check below for episodes and series from the same categories and more! to sing some of the biggest hymns ever written. They'll make the hairs on the back of your neck stand up. and Jaz Ellington from BBC One's The Voice. Our Junior School Choir Of The Year Heath Mount are here. or join in and sing along in this Songs of Praise spectacular? from the magnificent Royal Albert Hall! I tell you, this is where Songs Of Praise really goes to town. You may be wondering why it's called The Big Sing. conducted by Paul Leddington Wright! Saint Michael's Singers and Brighton Festival Chorus! ready to sing - isn't that right? That's pretty big in my book, I have to say! to be stirring and exciting. Let's start with one that should really raise the roof. The mood is triumphant, the imagery, striking. It's Crown Him With Many Crowns. but now it's time for our first star guest. in Fleetwood, where he entertained his colleagues singing opera arias. and performing live at the Diamond Jubilee concert in front of royalty. Ladies and gentlemen, it has to be Alfie Boe. It has been an amazing journey, hasn't it? and lots of wonderful fans getting me on my way. -Do you miss the factory? What have been some of the highlights? Of course, her Majesty's Diamond Jubilee celebration. and sharing the stage with wonderful artists. The 25th anniversary of Les Mis was a pretty big one for me. Thank you. You're going to sing a hymn, Be Still My Soul. Very powerful one. It means everything to me. It's a beautiful hymn. whatever, you have to believe in the power of faith to get you through. And that's what I try and do. -Ladies and gentlemen, singing Be Still My Soul, Alfie Boe. Our next hymn really encompasses the whole world. of the thrill of congregation and choirs joining together in praise. It's the glorious All People That on Earth Do Dwell. in the School Choir of the Year competition. but despite their best efforts, always fell short of winning. so get ready to clap, OK, ladies and gentlemen? The Songs of Praise Junior School Choir of the Year is Heath Mount! someone who wrote the beautiful hymn they're about to sing. It's one of the nation's favourites. Ladies and gentlemen, please welcome David Evans. personally for me, it really brought me back to God. It's probably my favourite hymn ever. Thank you, Aled. That means so much to me. It's fantastic. It came to you in a flash, didn't it? you were more into your rock music at university. dressed as I am tonight, but I was a bit of a rocker in my teenage years. but they're probably best forgotten. Nothing has quite achieved the success of Be Still. I'm quite happy with the success that Be Still has had. it's got to have that certain quality that touches the heart. -Are you looking forward to hearing this choir sing? I should warn you, you've got about 15 seconds to get up into that box. David Evans, ladies and gentlemen! Singing, Be Still, for the presence of the Lord, Heath Mount School. # How awesome is the sight? Heath Mount School, ladies and gentlemen! It could be your school lifting the trophy. incredible in itself, but even more so, given that she was blind. This hymn lay hidden for decades. It's now recognised the world over as a wonderful hymn of praise. as when Isaac Watts wrote them. he'd give up all his hymns to have written just this one. Many millions enjoyed our next guest's amazing talents on the BBC hit show, The Voice. Ladies and gentlemen, please welcome Jaz Ellington! What was it like being on that show? Oh, gosh, it was the most scariest experience of my life. But also the greatest. It was so much fun. I learned so much. All in a short space of time. -Have you ever sung here before? -I've never seen it so full, though. -It's well-known that you have a faith. How much did that impact on you during the competition? You know what? It's all about believing. believe, you can do it. Throughout the whole experience. When you've got something to hold onto, faith, it keeps you going. And what about growing up? Was there lots of gospel music in the house? singing at all hours of the night. I'm trying to go to sleep. And she's singing at one o'clock in the morning, cooking in the kitchen. What did she used to sing? -Loads of hymns, like Nearer My God To Thee. Yeah, yeah, she's, gospel is part of my foundation. And what are you going to sing for us? I'm going to sing Angels by Robbie Williams. It's one of my favourite songs. the words are very powerful to me. I'd say I would've thought it was a hymn if I didn't know better! Ladies and gentlemen, singing Angels, it's Jaz Ellington! # Does an angel contemplate my fate? # When we're grey and old? Jaz Ellington, ladies and gentlemen! Now, let's continue to put the "big" in The Big Sing. It's time to fire up the organ. Ready to pull out the stops, it's Daniel Moult. the date in the church calendar with a special focus on Father, Son and Holy Ghost. went so far as to describe it as the world's greatest hymn. Well, where has the time gone? They do say it flies when you're having fun. We end this evening with a rousing and inspirational hymn of thanksgiving. nearly 400 years ago for his children to say before bedtime. It's a wonderful expression of praise and gratitude. thank you very much, and goodbye. for the stories behind their Mystery Plays production. and see how hundreds of local people are involved. which tell the Gospel story. 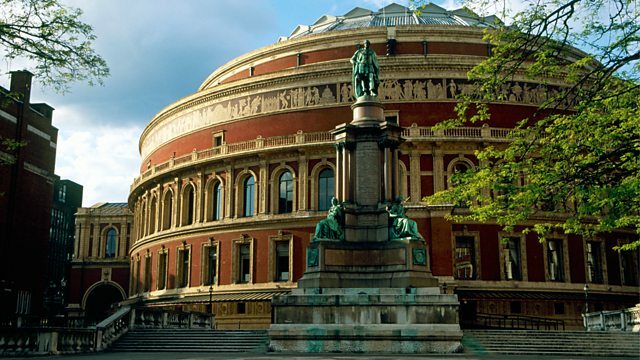 Tenor Alfie Boe and gospel star from The Voice UK Jaz Ellington perform hymns and songs with choirs and 5,000 singers in this Songs of Praise spectacular from the Royal Albert Hall.